Sometimes you just can’t help but feel blue. Things simply won’t go your way and spun out of control. And just when you are at the brink of desperation – The Elite Beat Agents come to lighten up your day! Yeah, as if anything like that is ever going to happen. But that is what this game is all about. These guys are supposedly a secret agency under the government. Their jobs – seek out people who feel they have the world on their shoulders and cheer them up with some tight, cool dance moves. Even though the concept was rather odd, you will find this game pretty funny and enjoying. Here’s why. The game features vibrant comic style graphics making it portray a lively feeling. The top screen displays the person who is feeling down and shows a picture of the situation he or she is in. The bottom screen is where all the dancing and cheering of the Elite Beat Agents is going on. The way the game is played is where the fun lies. What you have to do is tap the markers that appear all around the touch screen in the correct order. Some markers even require you to slide in a specific motion. But it’s not just hitting and sliding them, you also have to time it with the music because it dictates the motion of our dancing agents. 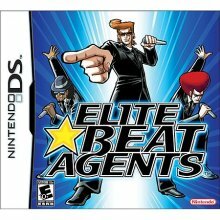 The Elite Beat Agents has a good number of songs with a lot of different genres to dance along with like Village Peoples YMCA and Avrile Lavigne’s Sk8ter Boi.